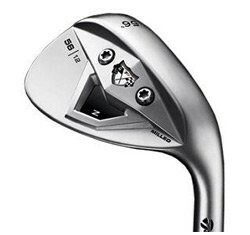 If you are looking for a wedge that plows right through the rough, this one is my pick. The TaylorMade TP xFT does everything well, but is really good out of the thick stuff. This clubface is specifically designed to promote increased spin. The face is made separately and then dropped into the milled pocket. This provides for fresh grooves with a soft feel with a rough surface for maximum spin. The club is heavy, but not too heavy. It has good distance control from the rough. The ball comes out high and lands soft. It works well in the bunker and has great, crisp feedback. The look of the club is modern with a player-preferred compact tear drop shape. I really like the duo flags centered between two screws on the back. As far as the cons, I like a little bit softer feel in my wedge. In addition, the club is not very forgiving. Off-center hits do not go very far, and it can be inconsistent on full shots off of tight lies. This is a decent wedge, but I prefer my Vokey Spin Milled Oil Can Wedge because of its softer feel and better spin around the greens.